Springerville, AZ - Sipe White Mountain Wildlife Area - A shorebird you can see without going to the beach, Killdeer are graceful plovers common to lawns, golf courses, athletic fields, and parking lots. These tawny birds run across the ground in spurts, stopping with a jolt every so often to check their progress, or to see if they’ve startled up any insect prey. Their voice, a far-carrying, excited kill-deer, is a common sound even after dark, often given in flight as the bird circles overhead on slender wings. 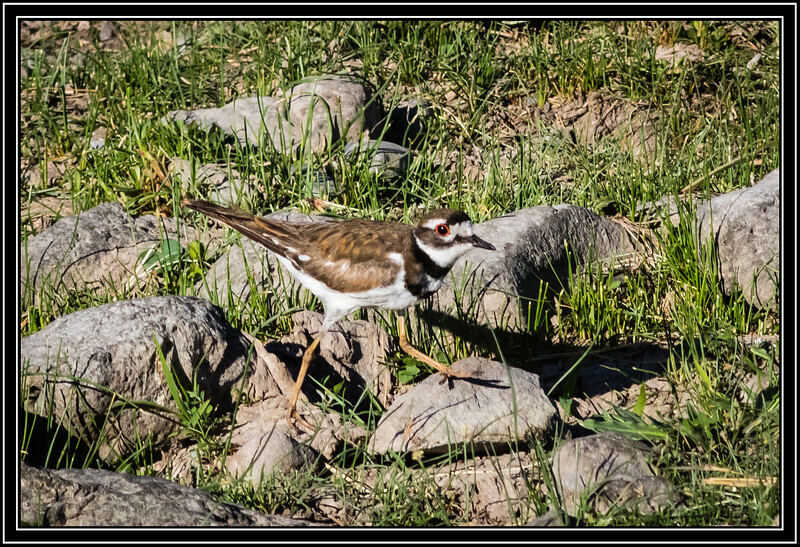 Magnificent capture of this Killdeer going for a walk. I love Killdeer, and even remember them from childhood when we had an influx of them on our front lawn--they did a good job of "whitewashing" our front walk. Knowing more now, I realize how surprising that they were there throughout the winter. Fantastic shot of this pretty guy. My hope in getting some bird shots this week we totally wrecked by foggy weather. Beautiful capture of a beautiful bird. Nice capture and like the shadow. Good catch of one of these fast little guys!